The cover .on this issue of the Newsletter is entitled "Bragg Diffraction from Parallel Planes". It won honorable mention in the Computer Graphics Contest at the Eight Biennial Conference on Chemical Education. The figure was submitted by ProfeQsor S. z. Lewin of New York University. The figure was produced by a 90 line Basic program written for an Apple IIe with 64 Kbytes of core and was printed usi11g an Epson FX-BO printer. Professor Lewin explains that the program permits the choice of the difference in path length between successive diffracting planes (as in a crystal or grating), as well as a choice of the total number of diffracting planes or lines. He has found this useful in demonstrating (1) the way in which the intensity of a diffraction line falls off with departure from the Bragg angle (2) the way line brqadening accompanies a reduction in particle size of a powder and (3) the relationship between grating size and spacing, and spectral resolution in a spectrometer. Last April a survey concerning the use of computers in general/freshman chemistry courses was conducted via a questionnaire mailed to approximately 800 chemistry department chairs at two and four year colleges. The primary purpose was to gather information to be used in planning the schedule and structure of the national CCCE workshops which have been conducted on a biennial basis for the past 12 years. Almost 300 questionnaires were returned with the largest portion of the respondees (over 50%) indicating a need for orientation in techniques of interfacing microcomputers to laboratory instruments. As a result of this survey, plus feedback from the highly successful '85 workshops at Potsdam and Reno, we are planning three-day intensive workshops on interfacing and CAI at Montana State University immediately after the 9th BCCE next summer. Details will appear in this newsletter and future mailings from Bozeman. The survey also provided interesting figures concerning how extensively computers have found their way into chemistry courses at the freshman level. In short, not very far! Five types of interactive, i.e. student-oriented applications were identified: drill and practice, tutorial CAI, stimulations, interfacing and data reduction. Of these, drill and practice was reported as being used "regularly" at only 25% of the institutions, with other categories showing significantly lower "frequent" usage. 46% indicated no use of any sort by anyone in the department. On the other hand, there were generally very positive responses to a question about the effectiveness of computer-based learning. Therefore, the reasons for the relatively low"usage are apparently more logistical than pedagogital. The situation at the high school level seems to be at least as bad, if not worse - worse, that is, if you agree that computers SHOULD be used throughout all levels and activities in chemical education (As John Moore frequently says: "If your chemistry students are not learning with and about computers they are being shortchanged."). In the November issue of School Science and Mathematics, Jeffrey Lehman reports on a survey of computer usage in high school science courses conducted during April of 1984. He found 77%· of the teachers surveyed make no use of computers and only 6% use them on a regular basis. On an institutional basis, in 41% of the schools not a single teacher used microcomputers in class. Dr. Lehman suggests as possible causes for the low usage: inaccessibility of hardware, lack of training and relatively high quality software. Although the logistical problems cannot be"denied, significant progress has been made in the past couple of years in terms of software development arid teacher training. The CCCE/SERAPHIM workshops reached approximately 750 teachers in the past year alone, and the software packages traveling with these workshops continue to improve in both quality and variety. There is another factor, however, that must be considered when trying to account for the relatively slow rate at which computer usage is really taking hold. Glenn Crosby points to it in his thought provoking article in the September issue of the Journal of Chemical Education. In Glenn's words, "The promise of computers for improving educational delivery is clear and undeniable." He then points out the challenge to us - the chemical educators - to learn how to use computers in ways that are not only pedagogically equal or superior, but also labor-saving for the individual instructor. And this, I believe, is the key, for as Glenn observes: "When an educational innovation, no matter how effective, requires substantially more effort by the instructor than the standard chalkboard or overhead projector, it is doomed to eventual extinction." I think that at the present time, many of our colleagues who do not use a computer in their courses may very well be convinced of its intrinsic value as a pedagogical tool, but they also see it as one which will demand considerable extra time and effort, if it is to be used on a regular, practical basis. Our real challenge is to dispel this attitude. 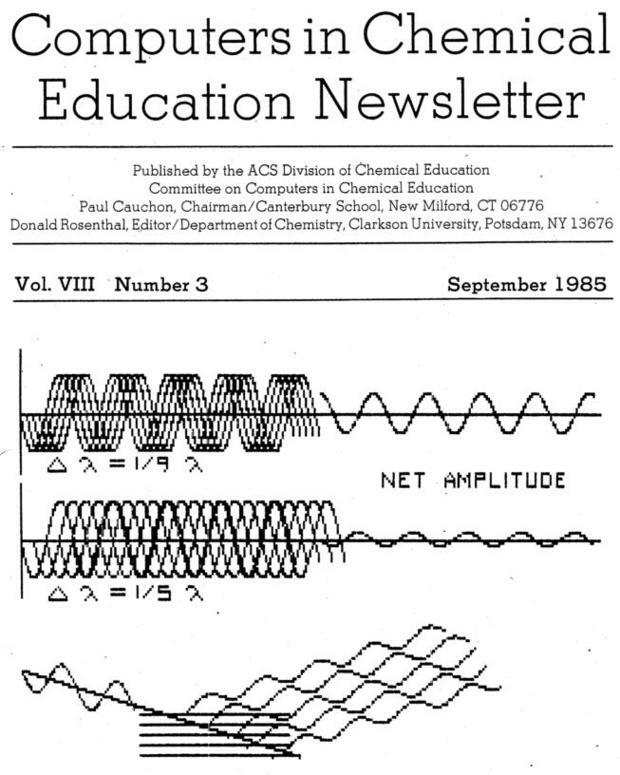 Otherwise, the impact of computers on chemical education may never progress beyond that relatively small percentage of dedicated teachers in whose classes computerbased activities and assignments are as commonplace as the text, the laboratory, and the chalkboard.